Last night, Hawaii not only elected Japan-born Mazie Hirono to be the first ever Asian-American woman elected to the Senate, they also elected Democrat Tulsi Gabbard as the first ever practicing Hindu to the US House of Representatives. Hawaii has been declared a Fox News Disaster Zone. 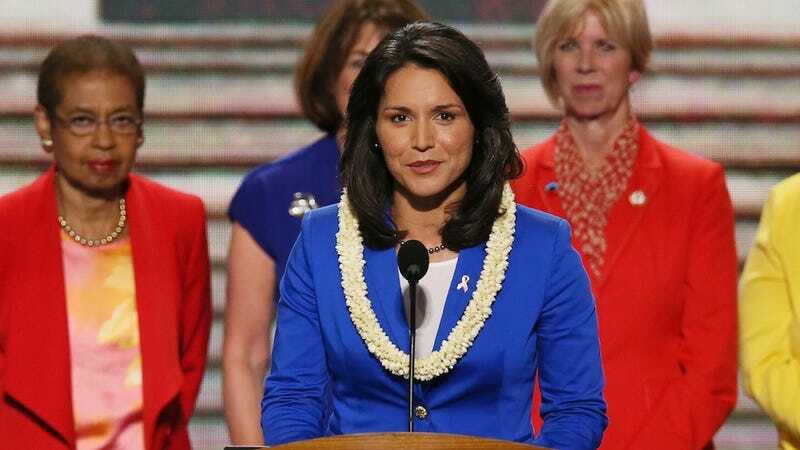 Thirty-one-year-old Gabbard is the daughter of two conservative Hawaii politicians and first ran for office at age 21. After her first term, she voluntarily served on a 12-month tour of duty with Hawaii's National Guard, and then became the first woman in the history of the Accelerated Officer Candidate School at the Alabama Military Academy to be designated a "distinguished honor graduate." Other non-Christian adherent Congresspeople include Minnesota's Keith Ellison, who took his oath of office over the Qu'ran. But as far as I know, no elected officials have been sworn in with a special edition DVD version of Cecil B. Demille's The Ten Commandments, which is probably what I'd pick.